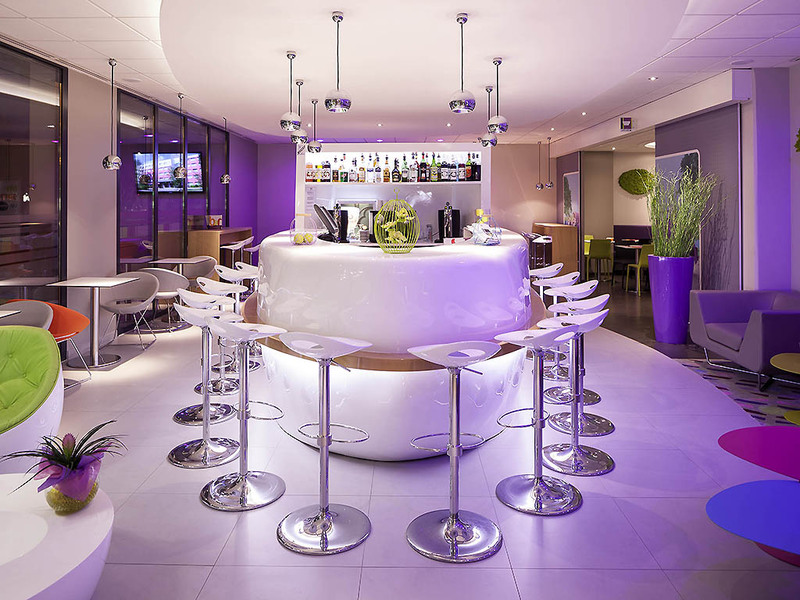 Breakfast and unlimited WIFI included in all rates at the ibis Styles Montbéliard Centre Velotte, a 3-star hotel in the heart of the city center, 2 mins from the Montbéliard station and 15 mins from the TGV train station. Birthplace of the PSA Peugeot Ci troën Group, visit Montbéliard, its famous Château, the Axone entertainment venue and the Peugeot museum. Boasting 69 modern and stylish air-conditioned rooms, fitness room and sauna, we know that you will enjoy your stay in Franche-Comté. Rate includes WIFI and access to the fitness center and sauna. 5 min by car from the PSA factory and 10 min from the Musée de l'Aventure Peugeot. Enclosed, underground public car park, secured at night and accessible by elevator. Purchase a pass directly from the hotel reception to get our preferential rate of EUR 7.50 per night. Please note: no access on September 23 from 8am to 1pm. Enjoy the friendly surroundings at bar Velotte. Its stylish and modern atmosphere will allow you to relax in complete privacy. The room was comfortable, albeit there was a dead bee next to the bed (not a big deal). Best thing by far was the breakfast! All the food was high quality and the freshly squeezed orange juice was top notch. Room is clean and comfortable, breakfast is simple but nice, good WIFI access and internet speed. Everything is very good, except the prices are a little higher. during my stay, the laundry service was stopped due to the service company's vacancies but there was no substitution. It caused some inconvenience to my stay. The hotel is easy to find amd well sign posted in town. Car Park is spacious if you arrive in the evening. Reception was a little brittle but efficient. Room was great although bed a little firm. Eating involved setting out into town with little guidance to find a place to eat in a town that seems to be shut on Thursday evening. This 3 star Ibis style exceed my expectation. Best location, underground parking is a big plus. Beds are comfortable, clean modern room, clean bathroom and very friendly staff. They even have free coffee and water at the lobby. Breakfast with fresh press orange juice just top it all.aside from fresh local product from the area, like cheese , sausages, eggs,they have everything what i wish for breakfast. I am accord member and been to many accord hotels but this one is the best si far. good position, but reception call the taxi is not the official permit operation taxi. Our favourite Ibis Styles! we have stayed at more than a dozen Ibis Styles but this is the one we like best. Always immaculately clean, staff are friendly and helpful, rooms are comfortable and well-equipped- not the biggest rooms but adequate. Parking is also convenient . Convenient location. Helpful staff. We’ll definitely come back. For the moment no idea. Quiet place in the city centre. Car parking under the hotel.